Cable Beach is located in Broome, Western Australia, and is considered the most popular tourist spot in the state. Cable Beach is a stunning beach, with fine white sand, a stretch of blue Indian Ocean, and exotic sunset views. This beach is also famous for its facilities along the beach with a camel ride. Feeling afraid of riding a camel? You can choose motorized transportation instead of crossing the sand with four-wheel-drive vehicles. The beautiful island of Fraser is located in Queensland and is listed as one of the world's heritage, and is the largest sand island in the world. The island offers views of rainforests, sand dunes, sand cliffs, and over 100 freshwater lakes. One more unique from this tourist spot in Australia is you can see the sight of rusty shipwrecks. Fraser Island is claimed to be the most pristine island in the whole of Australia because the island has not been contaminated by many humans and dogs is the island's main occupant. Great Ocean Road is located in the state of Victoria and is considered one of Australia 's most scenic tourist attractions. The main activity here is the drives which are a trip using the car. The route drives start from Torquay which is about 100 km from Melbourne and ends at Allansford. With this route, you will travel 243 km with scenic views of Victoria's south-west coast and some breathtaking scenery in Australia, including The Twelve Apostles. There are also a number of places along the Great Ocean Road where you can see some of Australia's famous wildlife such as kangaroos, fur seals, and emus. Situated east of Australia, Purnululu National Park is home to one of Australia's most unique tourist attractions known as the Bungle Bungle Range. 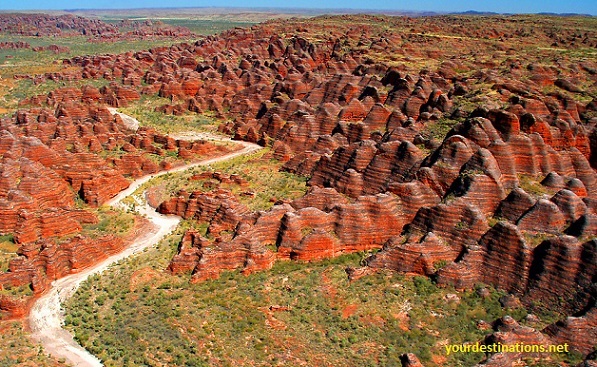 Bungle Bungle Range is a sandstone dome with striking orange color and black stripes resembling a large beehive. Surprisingly, this site is only known by Aborigines and local farmers who later became famous after the documentary film made in this area in 1983. Since Purnululu National Park is located in a quite remote area, there are two camp camps provided for the tourists. Blue Mountains National Park is located in New South Wales, about 80 km west of Sydney. Its location is close to Australia's largest city has made this beautiful park a favorite tourist destination for tourists. The most famous of these national parks is the Three Sisters, towering rock formations as high as 900 meters above the Jamison Valley. Blue Mountains National Park is the perfect place for those who want to enjoy adventure tours or enjoy activities that trigger adrenaline like rock climbing and abseiling. Whitsunday Islands is an amazing collection of 74 islands located amidst the Great Barrier Reef of Australia. This Australian tourist spot is the perfect location for those who want to explore the colorful underwater life with snorkeling or scuba diving. One of the best parts of the Whitsunday Islands is a beach called Whitehaven Beach. This beach in Australia offers a blinding white sand. The islands are a selection of tourist sites in Australia that are perfect for those of you who are looking for a happy and colorful holiday atmosphere on a beautiful tropical island. Located north of Australia, about three hours north of Darwin, Kakadu is Australia's largest national park. There are many things you can enjoy in this national park, including Aboriginal artworks that are estimated to be over 20,000 years old. The park is also home to many different wildlife species including wallabies, dingoes, and crocodiles. In addition, here also there are various species of birds typical of Australia. Ayers Rock is one of the largest monopolies in the world and has become one of the best tourist attractions in Australia. Ayers Rock is located within Uluru-Kata Tjuta National Park's Northern Territory. This super sandstone formation has a height of more than 340 meters. One of the uniqueness of this stone is that there will be a dramatic color change as the sun sets from terra cotta to blue, purple, and red. The local Aboriginal tribe, known as Anangu, calls it the Uluru stone and regards it as a sacred place. The Sydney Opera House has been regarded as one of the finest works of 20th-century architecture built by architect Jørn Utzon. The building was built as a reflection of the image of a large sailing ship. Each year, the Sydney Opera House is the host of 1,500 exciting performances. Surrounded by scenic views of Sydney Harbor and the Royal Botanic Gardens, Sydney's famous Opera House is one of Australia's most famous landmarks. Well, that's a recommendation review of tourist attractions in Australia that must be visited from Yourdestinations.net. Which tourist attractions are most interesting to you? Share, please!